I am a tenured Associate Professor in the Wildlife Biology Program.My appointment is a 9-month tenure track position (67% Teach, 33% Research). I teach courses at UM that reach a cross-section of wildlife graduate students (Landscape Ecology WBIO560), Jr/Sr undergraduate majors (Wildlife Habitat WBIO370) and freshman non-majors (Wildlife & People WBIO105N). This is the first time that WBIO105N and WBIO560 have been offered on campus. I developed WBIO105N as an ecological literacy course for non-majors to satisfy 3 credits of their Natural Science (Gen Ed) requirements. This course is gaining in popularity with 100+ non-majors enrolled Fall 2006. In Spring 2002 and 2003, 42 MS and PhD students completed my new WBIO560 course. I also completely revised and updated the WBIO370 Wildlife Habitat course materials. Changes include six 5-hr hands-on field trips, assignments to improve writing skills, and GIS labs to expose our majors to new technologies. My average teaching scores on student evaluations questions 1-4 (course content/instructor's effectiveness) were 4.5 (WBIO105N), 4.0 (WBIO370) and 3.9 (WBIO560) on a 5.0 scale (1 = poor and 5 = excellent). I also advise an average of 34 undergraduate majors and sit on 8 graduate student committees. My primary applied research interests are in understanding relationships between organisms and their habitats in a landscape context. Critical thresholds in abundance and spatial arrangement of habitats likely vary among species that perceive habitat suitability on a hierarchy of scales. Using the newest GIS and remote sensing technologies, my students and I quantify the importance of local and landscape attributes influencing habitat use of grassland and wetland birds in prairie and sagebrush ecosystems. risk assessment modeling to characterize factors influencing tillage of native rangeland resources. I have published 40 papers in peer-reviewed journals and co-authored 111 presentations at national and international conferences, 29 invited presentations to resource professionals, and 16 invited lectures at workshops and universities. I also maintain Adjunct Professor status at South Dakota State University (1998-). I have further served management and scientific communities by publishing 5 book chapters, 12 extension publications, 3 literature syntheses, and 1 book review. Naugle, D.E., K.E. Doherty, B.L. Walker, M.J. Holloran, and H.E. Copeland. 2011. Energy development and sage-grouse. Number 21 in S. T. Knick and J. W. Connelly, editors. Greater sage-grouse: Ecology and conservation of a landscape species and its habitats. Studies in Avian Biology: In press. Connelly, D. E. Naugle, and 19 others. 2011. Conservation of greater sage-grouse: A synthesis of current trends and future management. Number 25 in S. T. Knick and J. W. Connelly, editors. Greater sage-grouse: Ecology and conservation of a landscape species and its habitats. Studies in Avian Biology: In press. Doherty, K.E., D.E. Naugle, H. Copeland, A. Pocewicz, and J. Kiesecker. 2011. Energy development and conservation trade-offs: systematic planning for sage-grouse in their eastern range. Number 22 in S. T. Knick and J. W. Connelly, editors. Greater sage-grouse: Ecology and conservation of a landscape species and its habitats. Studies in Avian Biology: In press. Walker, B.L., and D.E. Naugle. 2011. West Nile Virus ecology in sagebrush habitats and impacts on greater sage-grouse populations. Number 10 in S. T. Knick and J. W. Connelly, editors. Greater sage-grouse: Ecology and conservation of a landscape species and its habitats. Studies in Avian Biology: In press. Bush, L.K., M.S. Boyce, D.E. Naugle, and 13 others. 2011. Population structure and genetic diversity of greater sage-grouse (Centrocercus urophasianus) in fragmented landscapes at the northern edge of their range. Molecular Ecology: In Press. Tack, J.D., J.C. Carlson, P.J. Fargey, and D.E. Naugle. 2011. Sage-grouse migration links the U.S. and Canada: A biological basis for international prairie conservation. Oryx: In press. Doherty, K.E., D.E. Naugle, and B.L. Walker. 2010. Greater sage-grouse nesting habitat: The importance of managing at multiple scales. Journal of Wildlife Management 74:1544-1553. Doherty, K.E., D.E. Naugle, and J.S. Evans. 2010. Horse-trading sage-grouse on the open market: A currency for offsetting energy development impacts. PLoS One: 5:e10339. doi:10.1371/journal.pone.0010339. Johnson, W.C., B. Werner, G.R. Guntenspergen, R.A. Voldseth, B. Millett, D.E. Naugle, M. Tulbure, R.W.H. Carroll, J. Tracy, and C. Olawsky. 2010. Prairie wetland complexes as landscape functional units in a changing climate. BioScience 60:128-140. Krausman, P.R., D.E. Naugle, M.R. Frisina, R. Northrup, V.C. Bleich, W.M. Block, M.C. Wallace, and J.D. Wright. 2009. Livestock grazing, wildlife habitat, and rangeland values. Rangelands 31:15-19. Copeland, H.E., K.E. Doherty, D.E. Naugle, A. Pocewicz, and J.M. Kiesecker. 2009. Mapping oil and gas development in the US intermountain West and estimating impacts to species. PLoS One: 4:e7400. doi:10.1371/journal.pone.0007400. Ribic, C.A., R.R. Koford, J.R. Herkert, D.H. Johnson, N.D. Niemuth, D.E. Naugle, K.K. Bakker, D.W. Sample, and R.B. Renfrew. 2009. Area sensitivity in North American grassland birds: Patterns and processes. Auk 126:233-244. 2008. Walker, B. L. Greater sage-grouse Response to Coal-bed Natural Gas Development and West Nile Virus in the Powder River Basin, Montana and Wyoming, USA. Walker, B.L., D.E. Naugle, and K.E. Doherty. 2007. Greater sage-grouse population response to energy development and habitat loss. Journal of Wildlife Management 71:2644-2654. Doherty, K.E., D.E. Naugle, B.L. Walker, and J.M. Graham. 2008. Greater sage-grouse winter habitat selection and energy development. Journal of Wildlife Management 72:187-195. 2007 Walker, B. L., D. E. Naugle, K. E. Doherty, and T. E. Cornish. West Nile virus and greater sage-grouse: estimating infection rate in a wild bird population. Avian Diseases. 2006 Kelsey, K. W., D. E. Naugle, K. F. Higgins, and K. K. Bakker. Planting trees in prairie landscapes: Do the ecological costs outweigh the benefits? Natural Areas Journal 26:254-260. 2005 Naugle, D. E., C. A. Aldridge, B. L. Walker, K. E. Doherty, M. R. Matchett, J. McIntosh, T. E. Cornish, and M. S. Boyce. West Nile virus and sage-grouse: What more have we learned? Wildlife Society Bulletin 33:616-623. 2005 Johnson, W. C., B. V. Millett, T. Gilmanov, R. A. Voldseth, G. R. Guntenspergen, and D. E. Naugle. Vulnerability of northern prairie wetlands to climate change. BioScience 55:863-872. 2004 Naugle, D. E., C. L. Aldridge, B. L. Walker, T. E. Cornish, B. J. Moynahan, M. J. Holloran, K. Brown, G. D. Johnson, E. T. Schmidtman, R. T. Mayer, C. Y. Kato, M. R. Matchett, T. J. Christiansen, W. E. Cook, T. Creekmore, R. D. Falise, E. T. Rinkes, and M. S. Boyce. West Nile virus: Pending crisis for Greater Sage-Grouse. Ecology Letters 7:704-713. 2004 Walker, B. L., D. E. Naugle, K. E. Doherty, and T. E. Cornish. From the Field: Outbreak of West Nile virus in greater sage-grouse and guidelines for monitoring, handling, and submitting dead birds. Wildlife Society Bulletin 32(3):1. 2004 Higgins, K. F., R. G. Osborn, D. E. Naugle, and K. K. Bakker. Contrasting the potential effects of biomass fuel, soy based fuel, ethanol and wind energy developments on Northern Great Plains wildlife. 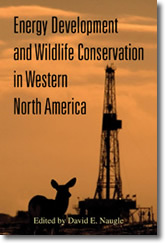 Transactions of the North American Wildlife and Natural Resources Conference 69:199-214. 2004 DeJong, J. R., D. E. Naugle, K. K. Bakker, and K. F. Higgins. Impacts of agricultural tillage on grassland birds in western South Dakota. Proceedings of the North American Prairie Conference 19:In Press. 2003 Eggebo, S. L., K. F. Higgins, D. E. Naugle, and F. R. Quamen. CRP field age and cover type effects on ring necked pheasants in eastern South Dakota. Wildlife Society Bulletin 31:779-785. 2002 Bakker, K. K., D. E. Naugle, and K. F. Higgins. Incorporating landscape attributes into models for migratory grassland bird conservation. Conservation Biology 16:1638-1646. 2002 Higgins, K. F., D. E. Naugle, and K. J. Forman. Changing land use and farm demographics in the northern Great Plains: An uncertain future for waterbird conservation. Waterbirds (Special Publication 2) 25:42-50. 2001 Naugle, D. E., R. R. Johnson, M. E. Estey and K. F. Higgins. A landscape approach to conserving wetland bird habitat in the Prairie Pothole Region of eastern South Dakota. Wetlands 21:1-17. 2000 Naugle, D. E., K. F. Higgins, M. E. Estey, R. R. Johnson, and S. M. Nusser. Local and landscape factors influencing black tern habitat suitability. Journal of Wildlife Management 64:253-260. 2000 Naugle, D. E., R. R. Johnson, T. R. Cooper, M. M. Holland, and K. F. Higgins. Temporal distribution of waterfowl in eastern South Dakota: Implications for aerial surveys. Wetlands 20:177-183. 1999 Naugle, D. E., K. F. Higgins, S. M. Nusser, and W. C. Johnson. Scale-dependent habitat use in three species of prairie wetland birds. Landscape Ecology 14:267-276.